Another try on this caged pendant. 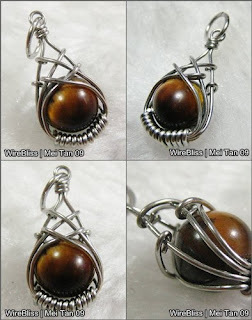 This time around its a round tiger eyes gemstone of about 1.2cm. I can only say this is much! much! easier than the heart pendant and earrings made previously (previous post). As it is round, I don't have to worry about how it sits in the cage. Whichever way it turns, it still look balance in all direction...hehe..
Nicely done...I like this caged, it show cases the stones well! !